MALAYSIA: Marvel Studios have announced today that they will produce a brand new sequel to the “Captain America: The First Avenger” movie. 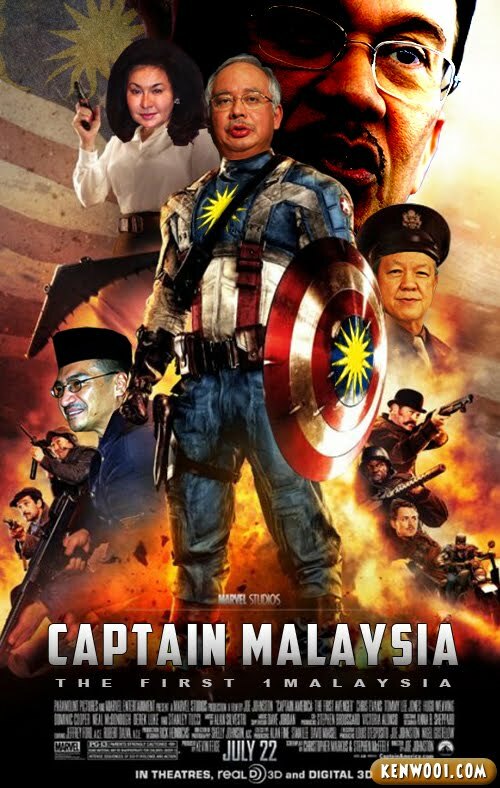 Captain Malaysia: The First 1Malaysia! Can you guess who’s our national hero behind that mask? Bet you guessed it right! He’s the one and only mighty man who will lead, protect and defend Malaysia! Story line: It is 2009, Malaysia is nearing Vision 2020, and determined Najib Razak is frustrated at being a leader of a not-unified country. Everything changes when the Malaysian Parliament recruits him for the Project Prime. Proving his extraordinary courage, wits and conscience, Najib undergoes the appointment as Prime Minister and he is suddenly gifted with the vision of 1Malaysia. Malaysia becomes Boleh and the rest is history. Malaysian fans are definitely anticipating the release of this blockbuster movie in July 22, Year 2020. – This movie update is brought to you by Kenwooi News Network (KNN). LOL I couldn’t recognize who is it at first, until I saw his name in the storyline HAHA nicely edit weh! you must teach me how to edit as awesome as you! omg! ini photochop yang amat mengharukan! aku gemar! Cool photoshop skills man! With all the bad news in the paper, KNN brings a little cheer and joy for all! hahahhaha! creative wey! nice one! LOL! wtf man! 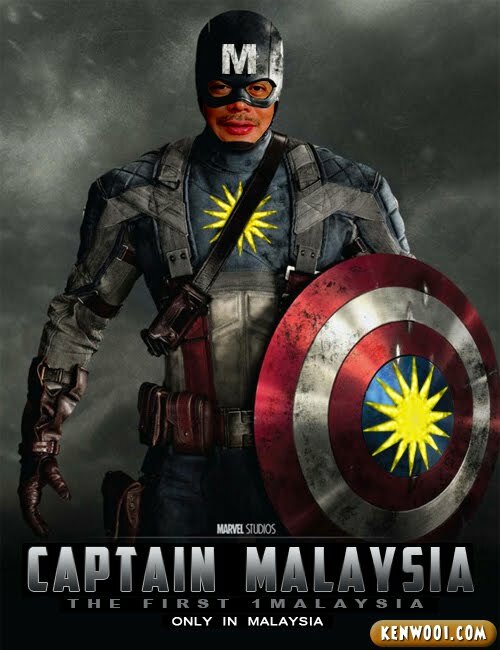 hahah .. do you know there’s actually a REAL captain malaysia? you can hear him over in flyfm. A short post but with a great photoshop skills. aiks!! why he’s the hero?? u photoshoped tis?! pro man! Nice movie poster! How much to pay if I learn from you? im laughing my a** off looking at the second picture! ngee…. awwww…. that awesomeness, yea captain 1Malaysia on duty… wonder what he’s gonna safe with? OMG! Rosmah is holding a gun! LOL! Good sharing Ken but my lips are seal, you know in Malaysia everything is so sensitive, cannot afford the ISA as need to survive. this one beats Kaptain Malaysia, ideas from FLy fm..lol..